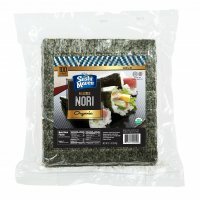 Kosher Roasted Sushi Nori Gold -100 Half Cut Sheets [NORGHC] - $13.99 : SushiMaven.com, Your Source For Everything Sushi! Since Nori is can get ruined when exposed to humidity, it's packaged in a moisture-proof resealable bag. Once the package is opened, make sure to remove all the air before closing it. And remember, it is always better to eat Nori soon after the package is opened.